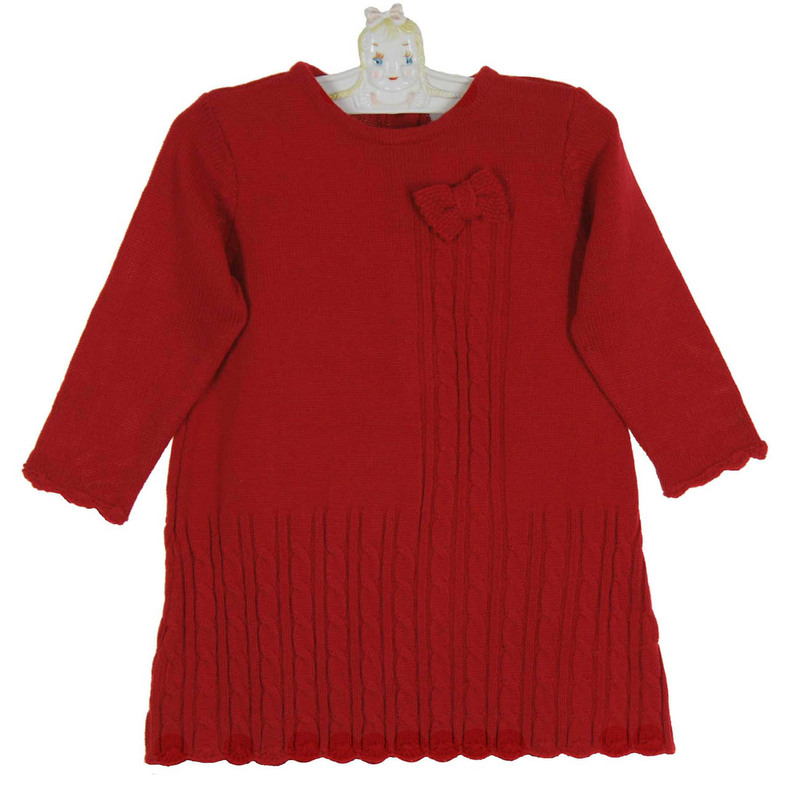 This beautiful red knit dress is made by Sarah Louise, a top British designer of beautiful baby garments. 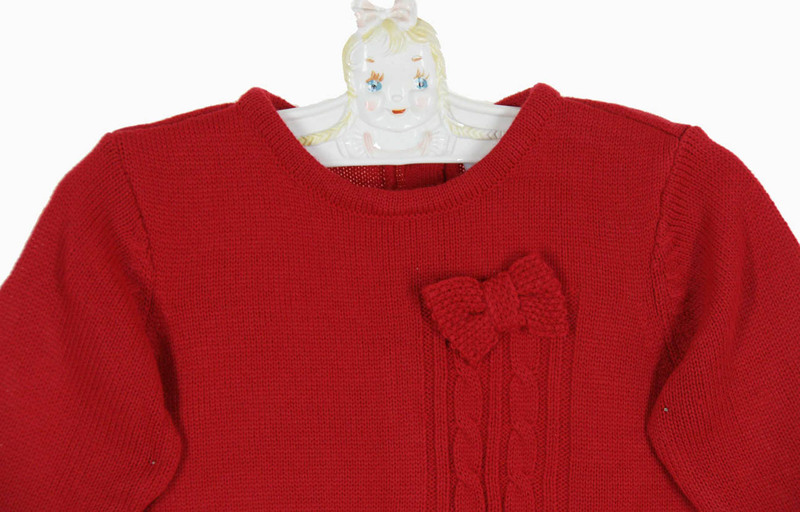 Made of soft acrylic, it features a unique cable design with a knit bow accent on the bodice. This lovely dress has a simple round neckline. 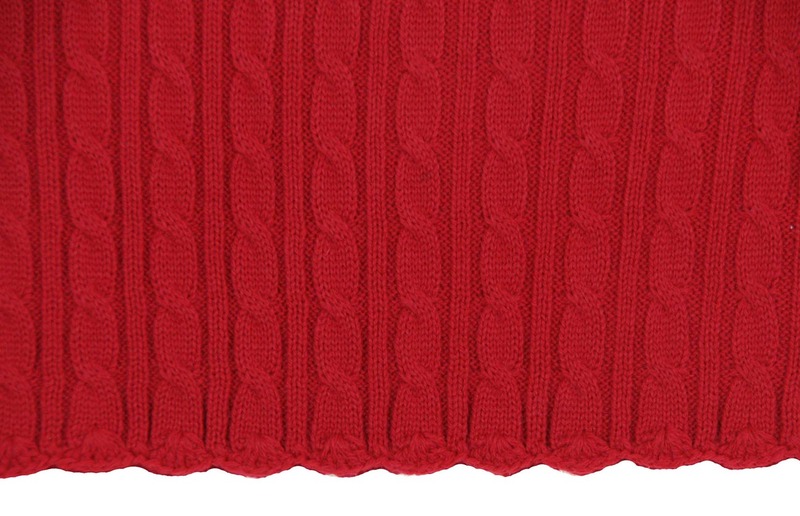 The hem and long sleeves are finished with knit scallops. It has a back buttoned closure. Lovely for your baby girl for Christmas, Valentine's Day, portraits or parties! Coordinating style is available for toddlers. This dress is also available in pink. See below. Grammie's Attic has the largest collection of Sarah Louise preemie, baby, toddler, and little girls' clothing you'll find anywhere. Be sure to see all our Sarah Louise items, including christening gowns, dresses, bubbles, rompers, longalls, button on shorts sets, ruffle bottom diaper covers, and smocked bibs! Grammie's Attic has a wonderful selection of holiday dresses and holiday outfits for your baby, toddler, or little girl. You'll find velvet dresses and rompers, smocked portrait dresses and longalls for brothers and sisters, and Christmas outfits that are perfect for pictures, visits to Santa, and holiday parties. Be sure to see all of our children's holiday clothing from your favorite manufacturers, including Polly Flinders, Feltman Brothers, C. I. Castro, Will'Beth, Petit Ami, Carriage Boutiques, Sarah Louise, Sophie Dess, Good Lad, House of Hatten, Rosalina, and many more.